Diving can be dangerous if the correct methods are not used, sometimes fatally. All divers have the responsibility for their own safety. Instructors, dive guides and diving 'Buddys' have a duty of care for those who are diving with them. Divers are reminded that they have the responsibility for the first actions to effect a successful rescue. On arrival at the centre, please ensure you complete a Visitors Declaration Form in the shop or on the gate Download PDF 792KB or visit the downloads page more>. The white customer copy must be displayed in full so all details are visible from your vehicle dashboard at all times. NDAC club members must display their cark park passes in the same way. Please make sure you read and understand the information about the centre and the depth of the water, which is displayed, on notice boards around the centre. Staff will be more than happy to help clarify any points. You must be no younger than 10 years old to dive at the NDAC. All junior participants/children must be closely supervised by adults at all times and never left unsupervised. The NDAC risk assessment is available from the shop. You are encouraged to consult this document and always to dive fully in accordance with the safe diving practices of your diving agency (e.g. PADI, BSAC, SAA, TDI/PSI etc.). Always dive within your qualification level. Divers are requested to plan their dives carefully. The diving site is 60metres above sea level. Can all divers take this into consideration and dive according to any impact it may make to your dive plan from your training organisation i.e. PADI, BSAC, SAA etc. Solo diving is not permitted. If you become separated from your buddy ascend without delay and notify an NDAC member of staff with immediate effect. Do not dive below 50meters on Air or Nitrox. 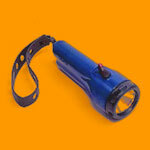 Do not dive below 30 meters without a torch. Do not dive without a whistle. Do not dive below 30 meters without wearing adequate thermal protection. Use a pony or other reserve cylinder below 30 meters. 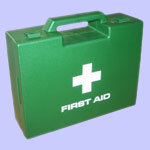 Yellows SMBs should only be used in emergencies. 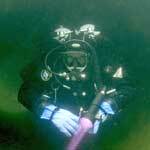 Wear a buoyancy aid or suit at all times when in the water or on the pontoons. Warning notices are displayed throughout the site and suitable lifebuoys and lines are provided at the waters edge or on the pontoons or in the safety boat. No unauthorised vehicle access to the turning circle or haul road unless agreed by NDAC in advance (except for emergency and NDAC vehicles). Keep at least 3 metres away from the quarry walls at all times, above and below the water. Underwater training platforms (see site map) are provided for training purposes. Non trainees should be aware that students are using these areas and may wish to plan dives avoiding such areas at busy times (weekends). A number of underwater attractions have been provided at the NDAC (please refer to underwater map or the attractions page for more info). Divers enter or otherwise interact with the attractions at their own risk. Do not enter an overhead environment unless you are properly trained to do so. Due to their confined space, these areas can silt up very quickly and do become hazardous without proper training. Diving in cold water has resulted in many preventable incidents at freshwater sites due to regulator freezing and divers wearing inadequate thermal protection. The daily water temperature is available on the site map, internet, or from a member of staff. Note that the water is likely to be several degrees colder at depth than it is in the shallows. Please refer to your owners handbook for information on using your equipment in cold water. Please also observe recognised safe diving practices that will minimise the risk of regulator free-flows and maximise the adequacy of your response should a free-flow occur. Notices will be published throughout the site when the centre is being used for activities other than diving. Certain areas of the quarry may be put Out Of Bounds (OOB) to divers while activities are being conducted. Do not dive outside the displayed opening times. 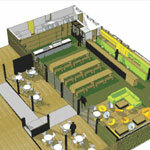 Speak to any of the centre staff if you are unsure about anything on the site. First-aid, rescue and emergency procedures have been put in place at the NDAC. The Centre staff will make every effort to respond as quickly as they can to any emergency on the site both in and out of the water. We also conduct emergency rescue and casualty evacuation drills periodically to test the effectiveness of our arrangements. Any incidents or dangerous occurrences WILL be reported to the relevant enforcing authority in accordance with our statutory duties. In the event of an accident alert the staff immediately. On the surface. Raise the alarm at once by blowing a whistle, shouting and waving or by pressing one of the emergency panic alarms buttons situated on the floating pontoons (please refer to site map for location). We also have an intercom system situated on the pontoons, outside the shed, that will allow you to speak directly to a member of staff. If you see anyone underwater with a problem wherever possible, help them to the surface and raise the alarm at once by blowing a whistle, shouting and waving. At the waters edge if you see anyone in trouble, raise the alarm at once by blowing a whistle, shouting and waving. While someone else alerts the centre staff, stay where you are, monitoring the person in the water until the person in trouble has been reached. Please then follow directions given by the centre staff. Diver Recall Signal. 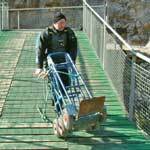 In the event of an incident that requires all divers to exit the water, members of staff will pound a heavy metal object against the side of the metal ladders at various points along the pontoon. If you hear the diver recall signal, make a safe ascent and exit the water by the nearest exit point. Please listen out for the signal at all times when underwater. 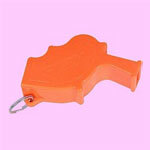 DO NOT RUN, OR BLOW WHISTLES unless there is an emergency. Please avoid the area around and underneath the Saltfree Freedive pontoon when their A flag is flying and they are diving. In particular we request that divers do not use the Freedive mooring lines for decompression stops. If the freedivers had to release their counterweight in the case of an emergency, there is the risk of being caught by a 60kg weight. 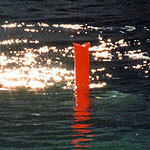 If you are using any type of re-breather use a Surface Marker Buoy (SMB) throughout your dive. However please note that yellows SMBs should only be used in emergencies. Do not dispose of Sodalime or any other scrubber material on the site. All diving schools, instructors, and other divers who use the centre in an at work situation, (i.e. receive payment or some other form of favour) are expected to operate in accordance with the requirements of the Diving at Work Regulations 1997 and any other relevant health and safety legislation. All recreational diving contractors operating at the NDAC will need to provide their own nominated surface cover person; their own oxygen administration set; and their own first aid kit. While staff at the NDAC will do their utmost to assist in the event of any emergency, the NDAC cannot guarantee to provide surface cover, oxygen, or first-aid to individual diving contractors working at the site. To maintain water quality and prevent potential health hazards can ALL divers and members of the public use the toilet facilities provided on site. 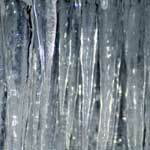 This will prevent potential harmful contamination of to the water. Theoretically Weils disease (Leptospirosis) can be a hazard at any inland freshwater site. The NDAC has never known anyone to contract the condition. The water at NDAC is tested on a regular basis to comply with the directive for bathing water. Do not harm any wildlife on site, or damage any property above or below the water. Do not litter the site. Dispose of litter in the bins provided. Do not use portable compressors on the site (except for the emergency services). All dogs must be under control and you must clean up after them. No dogs are permitted on the pontoon at any time. The Gas & Cylinder Charging Station (Gas Room) is out of bounds to ALL members of the public. NDAC staff will check ALL cylinders before filling to ensure there are no obvious defects. Pressure checks will be carried out and test stamps will also be checked. The centre reserves the right not to fill any cylinder it deems suspect. 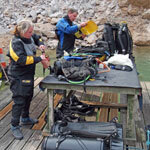 ALL divers requiring specific technical fills are to ensure they produce the correct paperwork. Mixed gas will not be blended without sight of your cert card or associated affiliation cards (no qualification no fill!). On completion of the fill you will be required to sign a log verifying that you have received your requested gas mixture. We have invested in a state of the art gas room. Fills are done on a first-come first-served basis. At busy times you may be required to wait for you fills. Our staff will give you an estimate of how long you may have to wait. Please be patient. Please ensure when you arrive on site you only park your vehicles in the designated parking areas. The courtesy vehicles will shuttle you and your kit down to the diving platforms. The shuttle service runs throughout the day. No vehicles are permitted onto the turning circle area at any time (except emergency services). Do not cause an obstruction with your car or equipment. We have a kitting up area in the car park. This is where the courtesy vehicles will pick you up and return you following your dive. 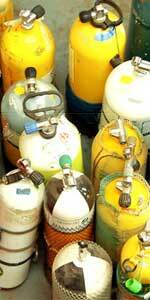 Please be courteous of other divers on the bus and their equipment when loading and unloading. We also provide kitting up areas on the pontoons. Please ensure ALL diving equipment is kept clear of walkways and kitting up benches to help other divers enjoy free movement on the pontoons and maintain access for emergency services. Any Equipment left on the pontoon that is seen to be causing obstruction, will be removed by NDAC staff. 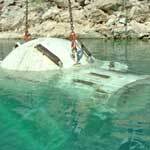 Neither NDAC ltd or its staff will take liability or responsibility for any dive equipment damage or loss, however caused, when using the courtesy buses or pontoons. 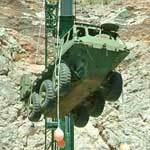 NDAC Ltd or its appointed staff cannot accept liability for your personal equipment and effects. If any equipment is found above or below the water we operate an honesty box that is situated inside the shop. CCTV is in operation throughout the site 24/7 and monitored for the purposes of crime prevention and public safety. 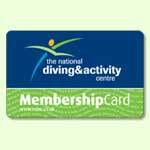 This scheme is controlled by the National Diving & Activity Centre. Climbing is not permitted on the site without the managers written authority. BBQs are prohibited on site. Bringing your own food to consume on the premises is also not permitted. 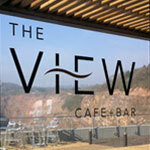 We offer an extensive range of hot and cold food from the View Cafe Bar.